When I was six, in a race to finish homework in order to watch Disney’s Wonderful World of Color, I did a sloppy job of coloring and ended up with a C. When Dad saw the grade, he asked me why my work was so sloppy. When I told him, he gave me advice I’ve never forgotten: If you want to succeed in whatever you do, do it well. I took those words to heart, not realizing at that moment that Dad had become my first mentor. Mentors are important to our work as writers because they not only point out where we’ve gone off course but never fail to support us. It’s that combination of criticism and encouragement that every writer needs to not only do his or her best but to keep writing, even when the odds seem against us. As you begin your journey as a writer, keep an eye out for your mentor. It could be a supportive high school teacher, or college professor, who gives you helpful criticism while cheering you on. Perhaps it’s a successful friend who is willing to give you the benefit of his or her experience. Or even a parent, who, despite wanting something else for you (my dad wanted me to be a lawyer) will still do his or her best to make sure you do yours. On each show I’ve written for, I’ve always taken away something helpful about writing from my boss, be it Len Katzman on “Dallas” (who taught me how to embrace every character and find something to love even in the most dastardly like JR Ewing), Ann Marcus on “Knots Landing” (who knows more about how to structure a show in her pinkie than most of us do after decades in the business) or Gary Tomlin on “Sunset Beach” (who insisted that we protect our hero, even if he’s in the midst of losing the girl). In Killer Ratings, I thanked several teachers who, in some way, contributed to my becoming a professional writer. They were all my mentors and I will always be grateful to them. Now it’s time for you to start looking for yours. 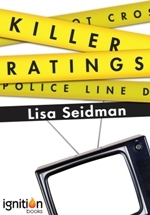 For those of you who live in the L.A. area or its environs, come to my Killer Ratings book signing at Book ‘Em Mysteries on Sunday, February 10 at 2 pm. Book ‘Em is located at 1118 Mission Street in South Pasadena, CA 91030. Phone number: 626-799-9600. I’ll be discussing my life in the TV biz. Hope to see you at Book ‘Em!